J1649+2635 is one of only four galaxies known to have both spiral arms and jets of subatomic particles propelled outward from its core at nearly light speed. A strange galaxy called J1649+2635, nearly 800 million light-years from Earth, has astronomers scratching their heads … but in a good way. Like our Milky Way, it’s a spiral galaxy, and it’s the most recent of only four known galaxies with prominent jets of subatomic particles propelled outward from its core at nearly light speed. The mystery is that spiral galaxies aren’t supposed to have such large jets. It took a combined effort of astronomers and citizen scientists to discover J1649+2635 and shed light on the mystery. According to a December 2, 2014 press release from The National Radio Astronomy Observatory (NRAO), the first spiral galaxy with a jet was found in 2003. The second was found in 2011, and the third was found earlier this year. All three spiral galaxies with jets were discovered by combining radio and visible-light images. In order to figure out how these jets can be produced by the ‘wrong’ kind of galaxy, we realized we needed to find more of them. Mao and other astronomers recently turned for help to volunteer citizen scientists, via an online project called Galaxy Zoo. So far, they say, more than 150,000 Galaxy Zoo participants have classified some 700,000 galaxies as spirals, ellipticals, or other types, using images from the visible-light Sloan Digital Sky Survey. Multiple volunteers look at each galaxy image to ensure accuracy in the classification. … a “superclean” subset of more than 65,000 galaxies, for which 95 percent of those viewing each galaxy’s image agreed on the classification. About 35,000 of those are spiral galaxies. J1649+2635 had been classified by 31 Galaxy Zoo volunteers, 30 of whom agreed that it is a spiral. The astronomers then cross-matched the visible-light spirals with galaxies cataloged at the radio end of the spectrum, using data from the NRAO VLA Sky Survey and the Faint Images of the Radio Sky at Twenty Centimeters survey. Via the cross-matching, they found the fourth spiral galaxy with jets – J1649+2635. Material pulled toward the black hole forms a rapidly-rotating disk, and particles are accelerated outward along the poles of the disk. The collision that presumably forms an elliptical galaxy disrupts gas in the merging galaxies and provides “fuel” for the disk and acceleration mechanism. That same disruption, however, is expected to destroy any spiral structure as the galaxies merge into one. This galaxy presents us with many mysteries. We want to know how it became such a strange beast. Did it have a unique type of merger that preserved its spiral structure? Was it an elliptical that had another collision that made it re-grow spiral arms? Is its unique character the result of interaction with its environment? We will study it further, but in addition, we need to see if there are more like it. 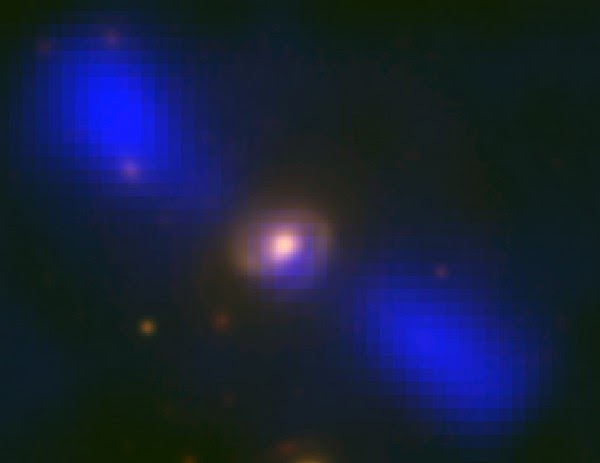 We hope that with projects like the Galaxy Zoo and another called Radio Galaxy Zoo, those thousands of citizen scientists can help us find many more galaxies like this one so we can answer all our questions. Visit Galaxy Zoo, and begin helping astronomers to classify galaxies.